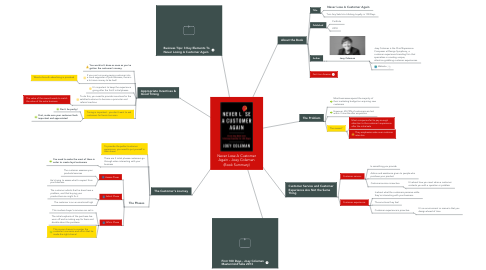 This mind map summarizes the key takeaways from the book "Never Lose a Customer Again" by Joey Coleman. 1.3.1.1. Joey Coleman is the Chief Experience Composer at Design Symphony, a customer experience branding firm that specializes in creating unique, attention-grabbing customer experiences. 6.3.3.3. This is your chance to counter the customer's concerns and affirm that he made the right choice! 7.1. You work isn't done as soon as you've gotten the customer's money. 7.2. If you can turn every paying customer into a vocal supporter of your business, there is a lot more money to be had! 7.2.1. Word-of-mouth advertising is priceless!